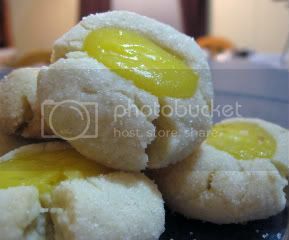 In honor of being able to eat gluten again yesterday I made Lemon Curd Thumb Print Cookies for our weekly small-group. On Monday I started by making my lemon curd. Ever since I have had lemon curd on an English muffin I have loved it but never dreamed it would be so quick and easy to make. In my opinion lemon curd is the perfect mix of sweet and sour. It took me under 15 minutes to make and when it was done it fit perfectly in my two small jars. The next morning I made the cookie dough. With just a few steps, a few ingredients and a little time I had my dough made. I rolled it into 1 inch balls then rolled those in sugar then for the finishing touch I pressed my thumb into every one of them to fill later on with lemon curd. Sadly I didn’t get any pictures of this step. I thought they looked so much like a Christmas cookie it made me want to put some Christmas music on. I cooked them for twelve minutes then I got to fill them with my lemon curd. They just had to bake five more minutes and they would be ready to eat. Once they were done of course I had to eat one, I could not take some cookies without knowing if they tasted good (mwahahaha). I ended up not going to small-group with everybody else due to feeling sick so I ended up saving a few to eat at home. Because I saved a few you get pictures. If you would like to participate in the Raising Homemakers Link-Up you can go here. Two months ago we started down a path of looking at food and how it affected our health. The girls have had many allergy/asthma issues over the last few years, and we were concerned that food was contributing to these issues. The first food that we eliminated was gluten. After several weeks on a gluten free diet we weren’t getting the hoped for results. This made us wonder if what we were doing just wasn’t enough. Two weeks ago we began the Specific Carbohydrate Diet. We were all extremely hopeful and enthusiastic about it, well, most of us. During the first week we went through the normal withdrawal issues, but coming upon the second week I began experiencing extreme fatigue, to the point that doing the dishes would wipe me out for the rest of the day. By Saturday, I had little to no energy. Which led us to a family meeting to re-assess the situation. During our family meeting we discussed both the pros and the cons of the SCD. The cons were: it was making food the center of our lives, it wasn’t bringing positive results, it was causing food to be an obsession, and it was causing many of us to feel worse than before. The pros were: we had become aware of how food was affecting our bodies, we were able to cleanse our bodies of many impurities, we began to eat better food, and we became aware of what was in the food we were eating. The result of our meeting was that we have decided to stop the SCD and adopt a better, well rounded diet. This decision was a very hard one for me to make and was something that was at the back of my mind for a few days. My desire is to do what is best for my family, and if the SCD isn’t what is best, I don’t want to continue down that path. During this meeting we also discussed those of us who are gluten free, trying gluten again to see if we had a reaction. We wanted to do this in a controlled way, in case we had severe reactions. Yesterday, we all tried gluten. Our hearts were racing as we put gluten filled foods in our mouths. For the next few hours we were all on pins and needles waiting for a reaction. Much to our joy, none came. We were all able to eat gluten with no side effects. I don’t know why we seemed to react in the past, I am wondering if it was an overload on our bodies. Where do you go from here, you may ask. We are going to adopt a healthful, well balanced diet. Our motto will be “everything in moderation”. We will try to eat foods in their most simple forms, and only having processed food where necessary and only occasionally. We will continue to not drink soft drinks and stick to water, tea and juice. We all have a new appreciation for the role that food plays in our lives, but want to have everything in our lives in proper perspective. As for this blog, we plan on posting just like we were before, only our recipes won’t be on such a narrow scope. I’m sure that we will have many recipes and hopefully pictures of the finished products to post. Our hope is that you will join us on this journey as we strive to be joyful homemakers who are serving Christ. We have not been able to eat salad in a few weeks due to being in the early stages of the SCD. In honor of being able to eat salad again I made my version of a Apple Avocado Waldorf Salad. Toss the first four ingredients in a large bowl, set aside. For the vinaigrette combine the rest of the ingredient well. Drizzle the desired amount of vinaigrette over the salad and serve. Enjoy!